Win the Ultimate Lifestyle Package! 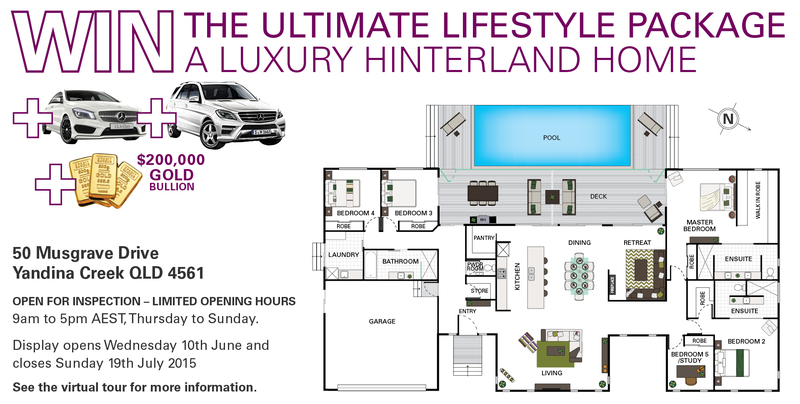 The lucky first prize winner will soon own a luxury hinterland home PLUS two Mercedes-Benz luxury vehicles PLUS $200,000 gold bullion! Overlook the breathtaking Sunshine Coast hinterland from your single level spacious home that gives you the best of both worlds, located in natural surrounds, yet only a 10km drive to renowned beaches, restaurants and shops. Entertain family and friends all year round from your expansive decked al fresco area, complete with your own sparkling infinity edge pool and built-in barbeque. The home offers all the quality, modern features you’ve come to expect from an RSL prize home, including large glass sliding doors to best enjoy the beautiful views, timber floors, stone benchtops and designer fittings. Relax in your expansive outdoor area leading out to your sparkling infinity pool and hinterland views. Enjoy breathtaking hinterland views from your master bedroom, kitchen, indoor dining and outdoor alfresco areas. This spacious, single level house features 5 bedrooms including two with ensuites and two living areas. The ultimate lifestyle package gives you freedom and endless possibilities! Win and you can start enjoying your prize instantly with $200,000 in gold to spend as you please – travel the world or live debt free in your new Sunshine Coast home. Plus, you’ll also have two Mercedes-Benz cars to take for a spin, worth in total of $149,426. Both cars are registered in Queensland and include all onroad costs, dealer delivery and GST. This prize also includes a $2,000 home and garden care voucher to help manage your 1.5 acre property.